like a ghost of a shadow, barely alive. Return to the world, and everything around you. We now live in a society where mobile devices have not only become a part of our everyday lives, but have also consumed them. Users on average are checking their phone around 150 times a day. This may sound like a high number, but over a full day it rounds out to about 10 times an hour. The quote above is meaningful in many ways. It’s showing that with all the services available, such as: Facebook, Twitter, Instagram, Snapchat, and Vine – we are more connected than ever. But in reality we aren’t really connecting at all. There are numerous jokes online showing how trends have changed in the ways we interact in person. It’s now normal for people in any given situation – meetings, parties, or events – to pull out their mobile device every few minutes to check social networks, messages, or just appear to be busy. The real question is – will it ever change, or just get worse? 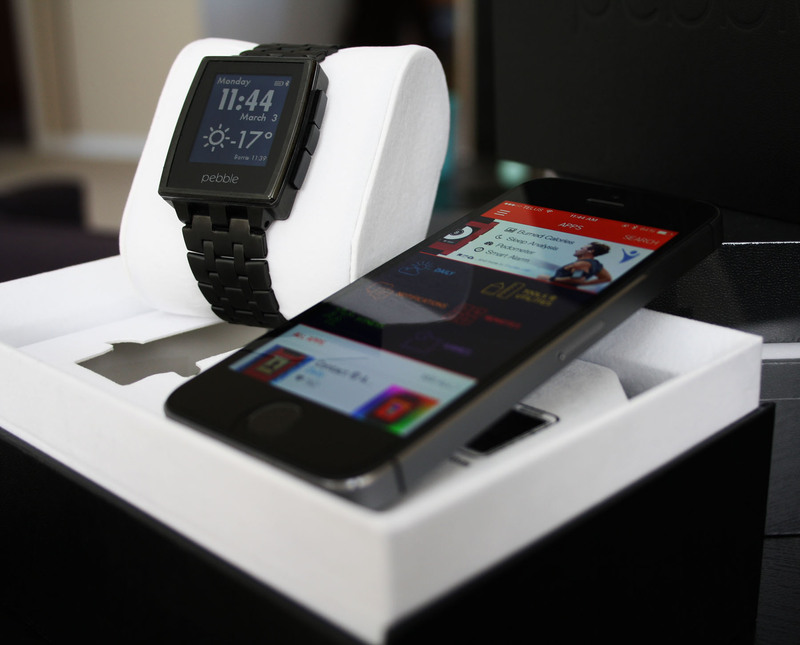 Pebble began as a Kickstarter fund in April of 2012. It broke records during the 45 day run, including raising $1 million in 28 hours, and totalling over $10 million in pledges when they only required $100,000. 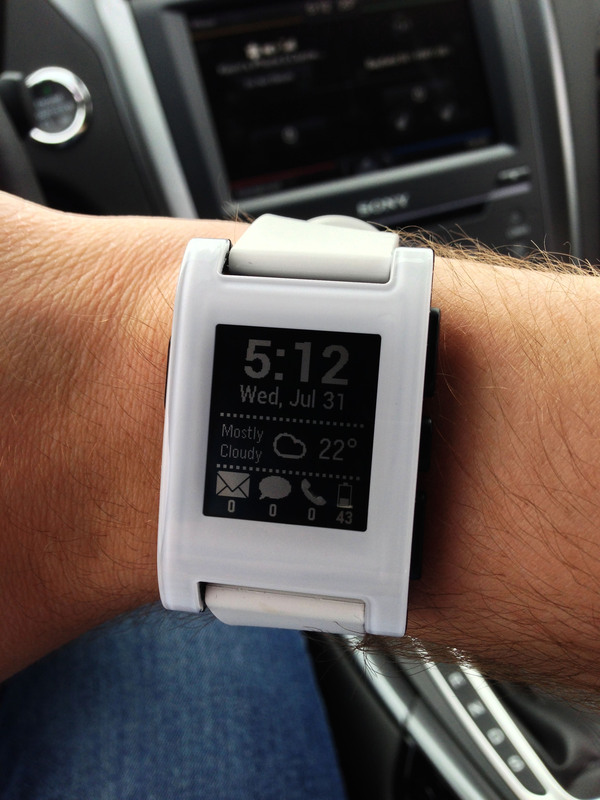 Pebble is a smart watch that provides the ability to see notifications from your iPhone or Android on the 1.26″ 144×168 pixel e-paper display. It has a vibration motor inside for when an alert comes through, and is fully submersible in water up to 5 ATM. The battery produces an average lifespan of 7 days before needing to be recharged using a magnetic USB charger. The original batch was supposed to ship out late summer of 2012, but ended up having delays. The first run finally shipped in January of 2013. It was received to positive response, and I decided to get one in July. I placed an order via their website, but was warned that orders could take weeks to fulfill. Impatience took over and I ended up buying the Arctic White model from eBay with a small premium. When it arrived I was eager to get it set up and discover the possibilities of this brand new experience. At that time, Pebble only offered basic functionality: call/sms alerts, email, and the ability to customize the digital watch face. You could even create your own at this website from your phone and upload it to the watch. Even though there wasn’t much initially, it presented a whole new way of thinking and it did change my habits. A whole new way to interact with notifications. My pre-order became available in early September and I ordered a couple extra for friends alongside a brand new one for myself. During the 3 weeks it took for delivery, I ended up privately selling the one I got from eBay (with only a $10 difference from my cost), and anxiously awaited the new batch. On the same day the new ones arrived, I was put into a position where an offer presented itself at nearly double what I had paid for mine, and it wouldn’t have made sense to reject it. Alas, I was Pebble-less again. Fast forward 4 months later, we now have the Pebble Steel. Although the Arctic White Pebble suited my personality very well, the Pebble Steel is by far the sharpest design they’ve created. It’s available in two different styles – Brushed Steel or Black Matte. The Brushed Steel is more of an original, classic timeless design. The Black Matte on the other side has more of an executive, high-class feel to me. Minutes after it’s unveiling at CES on January 6, I placed my order online. Nearly 2 months later it has arrived, and I couldn’t be more impressed with it. Each model comes with 2 custom-made bands (other bands are not supported at this time), giving a diverse look between a leather band or a metallic link style. A 1.3mm flat-head screwdriver is required to change the bands. One small detail I really enjoyed was the box. 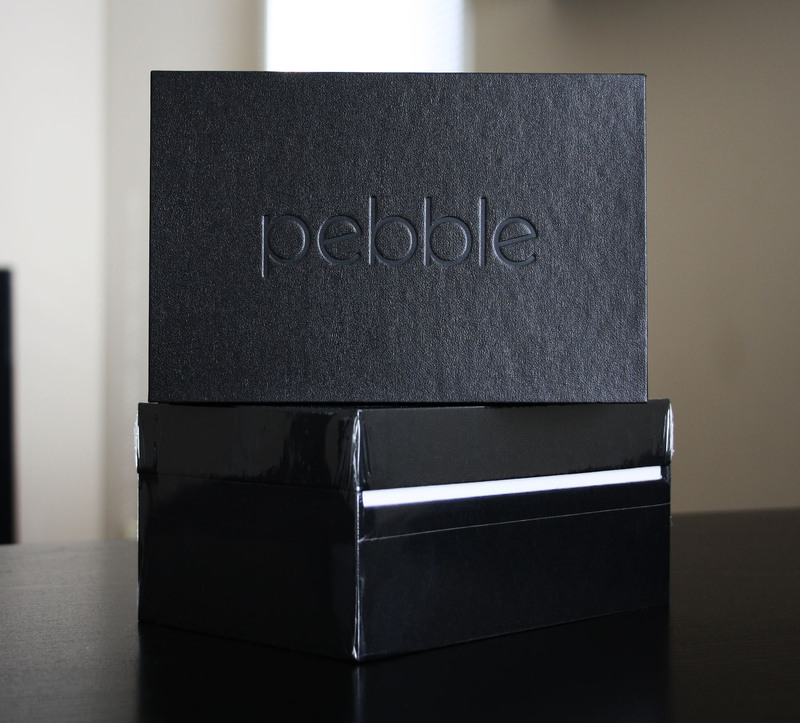 The original Pebble shipped in a very environmentally friendly carton, using the shipping parcel as the retail packaging with little material inside. While it was a very light package, it felt like it could get damaged with the way some of the shipping companies handle their deliveries. 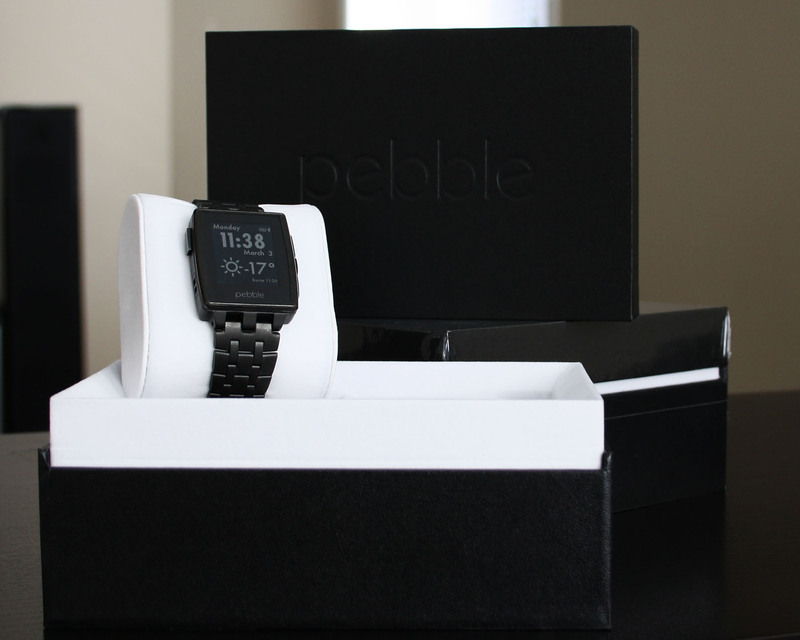 The Pebble Steel comes in a well designed box with soft felt lining, and presented itself very neatly packed inside. A brand new face lift for all users. Pebble has updated their app to Version 2.0, which brings changes for all Pebble users. A brand new interface allows better flow and organization for all the content that’s been created over the last year. Developers have come together to create very impressive work, with no worry of fragmentation between devices. The Pebble Steel only brought cosmetic upgrades, with the screen and internals remaining the same. This allows the confidence of an app working across all devices. Setting up the watch is very straight forward. The free Pebble iOS/Android app provides step by step directions in pairing followed by organizing the interface to suit your style. The app is your central hub for anything you need done on the watch, such as: installing watch-faces, managing apps, removing content, and more. Each watch is capable in having a mixture of 8 different items installed, whether it be a watch-face, an app or game. Pebble has updated the app to feature a ‘Locker’ where you can keep uninstalled items for future use, rather than looking for it again in the AppStore. I’ve had over 10 items in the locker plus 8 installed so there seems to be enough space for all of your multitasking needs. The app is split into three different segments: My Pebble, Watchfaces, and Apps. There are hundreds of different pieces to customize your Pebble’s look and functionality. Major networks such as Yelp, Foursquare, and Mercedes-Benz have created Pebble apps to provide additional functionality for their services. Developers have made companion apps for Philips Hue, Plex, WDTV, and more. The community will continue to expand as new tools and resources become available. Pebble has integrated notifications into IFTTT to set up customized events that will trigger alerts to be sent to your watch. Even Flappy Bird lives on with a remade version for Pebble. The Pebble Steel feels like a well thought-out product. The screen is enclosed in a new housing, which makes it thinner and is made of heavier materials compared to it’s plastic counterpart. The buttons are more responsive and tactile in comparison to the standard Pebble which is very appreciated, as they are pressed more than a few dozen times a day. I wasn’t enticed to the leather band installed by default, but still wore it for a couple days until I was able to get the metal link band resized. It may grow on me in the future depending on the situation or event I’m attending. A new charger is included as well, smaller than the original Pebble to accommodate the new chassis. Overall it’s a strong design, and looks great with any type of style from casual to a full suit. Leading the way in wearable technology. Since launch, the original Pebble has sold more than 300,000 units worldwide from it’s Kickstarter fund and through retail sales. 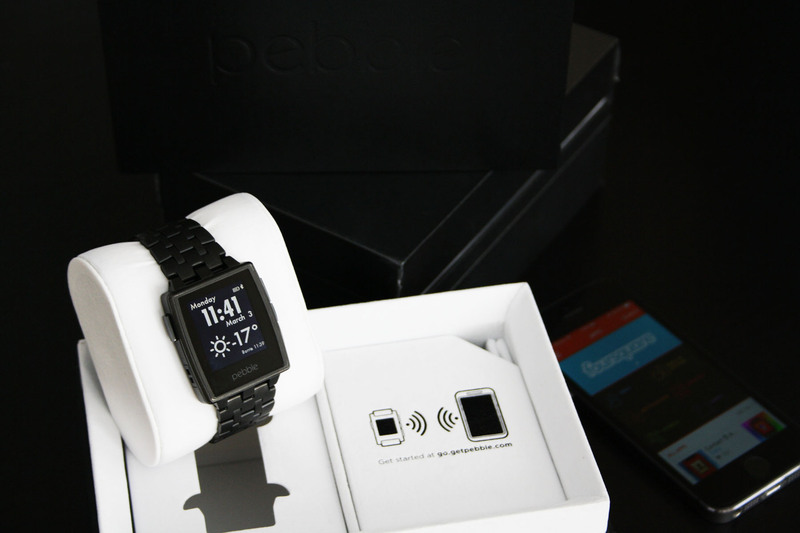 As of November 18, 2013 Pebble became available at Best Buy and Future Shop stores online. It’s evolving into more of a recognized product category with competitors jumping up and trying to get in on the hype, with very little success compared to the impact Pebble has caused. I look forward to seeing where the Pebble software evolves to, and the products that are brought to market building on this unique trend that’s only just beginning. So does the Pebble assist in helping people get re-connected with the world? Absolutely. During the numerous errands I’ve completed in the last few days, I’ve noticed significant results in the amount of time I felt the need to check my phone. By simply glancing to my wrist at pending notifications, alerts are taken care of when they need to be. When you’re awaiting on a call or message, it’s easy to stay focused in the task you’re dealing with opposed to consistently being distracted by seeing if it’s come through yet. And I think we all could use a little less distraction these days.